The Los Angeles Rams always planned to split carries between their two running backs in the Super Bowl, coach Sean McVay revealed on Tuesday. 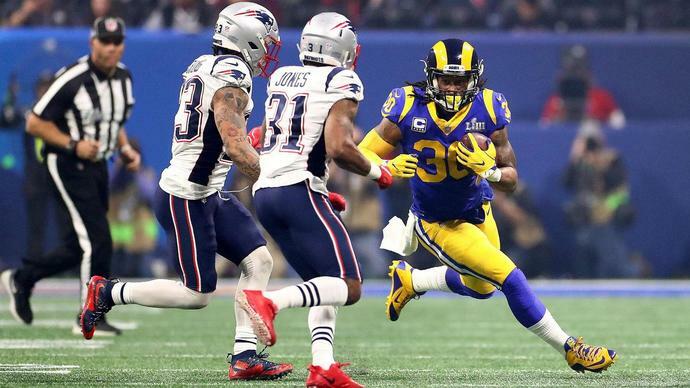 Los Angeles star Todd Gurley received just 11 touches in his team's 13-3 loss to the New England Patriots on Sunday, one game after he also had a reduced role in the Rams' win in the NFC championship. McVay explained the team also wanted backup C.J. Anderson to be involved in the offense against New England. "We had gone in knowing that we wanted to kind of almost have a shared load between he and C.J.," McVay said at his season-ending news conference, via USA Today. "So, the amount of attempts just rushing the ball the last couple games was a little bit different." McVay said Gurley's opportunities were limited because of the game's flow. "We didn't get the amount of plays off and didn't have the drive continuity [we wanted]," McVay said. "That's a big result of why those opportunities were limited for him and just going into the game the way we had thought." Gurley ran for 35 yards in the Super Bowl loss while C.J. Anderson added 22 yards on the ground on seven carries. "When you look at the overall work that a player of Todd's calibre got, it was in large part due to the fact that we had gone into the game saying we wanted to get both those guys involved," McVay said. "Then, as a result of us not being quite as efficient or not being able to convert on those third downs, it just limits those ops." Gurley finished 2018 with 1,251 rushing yards and 17 touchdowns. He missed the last two games of the regular season because of a knee injury.